60 processing tools for facilitation planning, responding to the needs of your group, and improvising when the unexpected happens. Sign up for early bird pricing. Regarding potential plans or actions, have participants discuss: How would you would feel about it in 10 minutes? How would you feel about it in 10 months? How would you feel about it in 10 years? Repeat with different ideas. Pass out paper and writing utensils. Have participant create a grid with four quadrants, and ask them to draw four different images according to a prompt. For example, regarding a concept, you might ask them to draw "Initial, Past, Present, and Future." Assign "hats" that require thinking outside one's default paradigm. For example, "white is logical, data," "red is emotional, feelings," "black is pessimistic, flaws," "yellow is optimistic, upsides," "green hat is creatively reworking others’ suggestions," "blue hat is facilitator of process." Change hats periodically. Each person makes a sign proclaiming a statement (should be short/easily readable). After everyone has made their sign, have the group move around the room silently viewing each other's signs. Have them stand in a circle/sit after they've viewed (most) everyone's sign. Pass out index cards for anonymous questions. Ask everyone to write a question (or write something even if they don’t have a question) and collect all cards. Read the question aloud, answer it, repeat. Give each group a fact, plan for the future, or something that has already happened, and ask them to consider how things would be different if that weren't true, you did the opposite, or that didn't happen. What alternative timelines crop up? What can you learn from these counterfactuals that can inform your decision-making? Frame the goal of the list or checklist (e.g.,. "We're going to create a checklist of..."). Have the participants share answers and record them on the flipchart. Clarify anything you don't know how to summarize before writing it down. Consolidate redundant shares into the one item. Set up the space for easy movement. Prime the group with a topic or concept, and ask for one participant to make a related statement they believe. Other participants respond by moving closer or farther based on their agreement or disagreement. Ask for another statement, then repeat. Place a central concept that you want to explore at the center of the paper. Have participants generate all the ideas, themes, categories that spring off of that central concept. Continue by instructing participants to map the secondary concepts, tertiary, etc., to as many levels deep as you like. Facilitator asks a question or delivers a prompt and participants respond by placing themselves (physically) on a spectrum from strongly disagree to strongly agree (or other poles). Between each prompt, allow for popcorn shares from different positions. Individuals will use sticky notes to generate ideas, one idea per sticky note. This can then get put up on a wall in no particular order and then organized by theme. When the group is considering multiple options for a decision, strategically remove one (or several, or all of them), and prompt the group to make a choice under those new conditions. Can be repeated several times. Facilitator Cards are helpful throughout the entire facilitation process. From long before you get in the room, until you're packing up your supplies and giving hugs & high-fives on the way out. Easily map out the processing tools and flow you'll use to accomplish your goals. Jot down the activity you're planning on each card. Erase or reorder — flexibility on demand. When a new need presents itself during a facilitation, choose from your remaining cards to react accordingly. Give your group the power to help steer the ship. Have an hour left that you weren't expecting? Did your ideation activity fall flat on its face? No worries! Shuffle the deck. Choose another card. The deck is stacked with processing tools for evoking emotions & thoughts, brainstorming new ideas, clarifying a concept, and making decisions. Mix up how you're engaging a group toward those goals throughout a facilitation. Stop the broken record of "Why don't we just go around the circle and hear from everyone?" 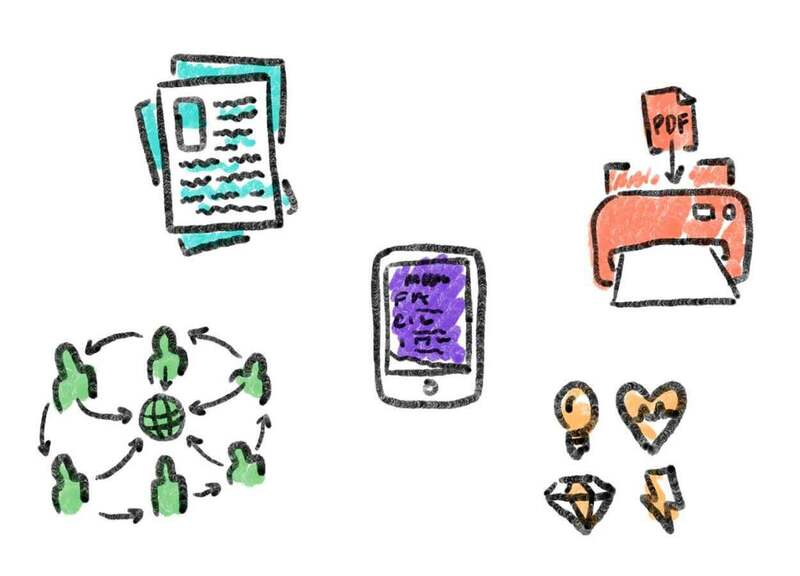 Every deck comes with facilitation guides, an e-book, files for printing, a set of facilitator icons, access to a community of facilitators — and more! As we make 'em, you get 'em. Join our launch list. Get early bird pricing. by the same two humans behind Facilitating.XYZ (a free online resource for all facilitators), Unlocking the Magic of Facilitation (book about key facilitator concepts), & The Safe Zone Project (free curriculum & train-the-trainer retreat guide). like everything else we make. The ideas, processing tools*, and resources that we've created and shared on this site are uncopyrighted & open-source . We release any rights we have, and you're empowered to share, modify, reprint, and improve — no permission needed, it's yours, our gift to you. *The Facilitator Cards themselves (i.e., the design & packaging) are distributed under a Creative Commons BY-NC-SA 4.0 License, which means can freely download, use, and modify the cards, but can't sell them without permission. Designed & supported from sunny Austin + rainy Seattle; ethically manufactured & assembled in Hong Kong.